The group was begun many years ago; the intent was that the Lutheran World Relief (LWR) would distribute them throughout the world. We are still doing this and the group contributes yearly. Fewer quilts are now sent to LWR for two reasons; the first is that the group has gotten smaller; the second is that we have so many people in our area who need some special, loving care and a quilt offers this. We give quilts to people who have been hospitalized, people who are home-bound, people suffering from injustice, and struggling young mothers through an organization in Duluth called Life House. We have given to victims of floods, tornadoes, fires and accidents. We have given quilts to Essentia Health, where they were distributed to people undergoing chemotherapy. 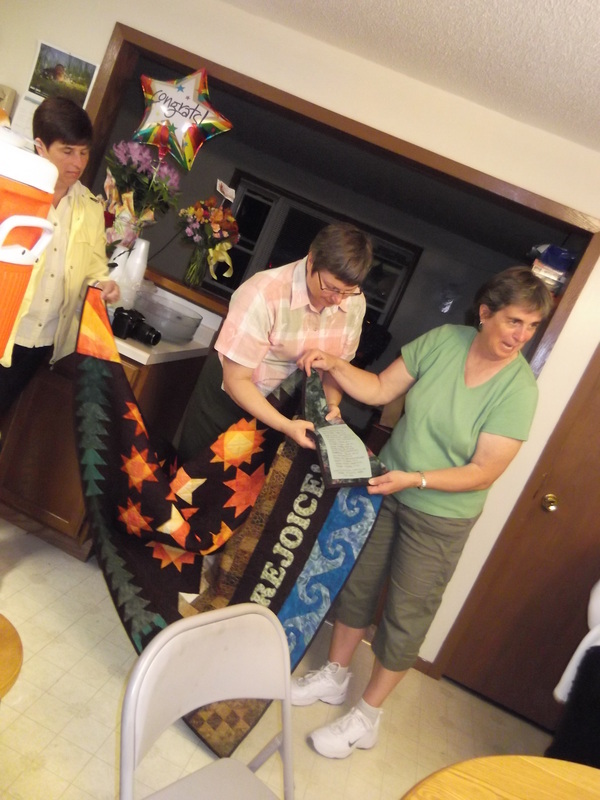 High school graduates affiliated with Messiah receive a quilt, as well as baptized babies. The list could be endless. In addition to quilts, we also put together school kits that are distributed all over the world; each school kit consists of a handmade school bag that contains many of the essential school supplies. The congregation is wonderful about helping with this project. To a person receiving a quilt, the message is clear: you are not alone, you are not forgotten, and someone cares for you. 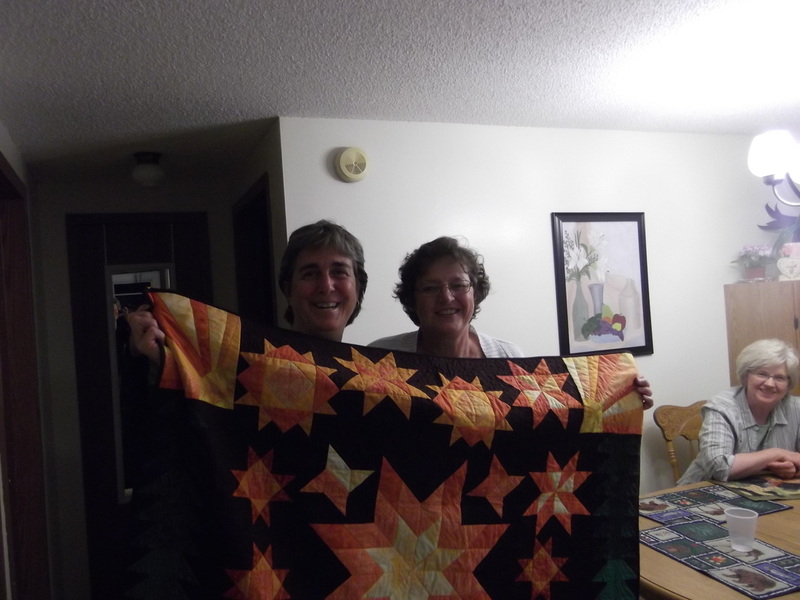 For those in the Loving Hands Quilting group, making quilts represents community, sharing and love. Those who come together each week share prayers, joys and sorrows around our quilting table. Our care is woven into every stitch taken. Donations of fabric and money for batting and sewing supplies are always welcome. Thank you to everyone for your help in keeping this program alive. This group began many years ago. The intent was that Lutheran World Relief would distribute quilts throughout the world. This year 64 were sent out. We’ve sent fewer to LWR because we have so many people in our area who need some special, loving care and a quilt offers this. Locally, quilts were given to Ashland Cares, New Day Shelter, needy families, the cancer treatment center, graduates and baptisms. The Loving Hands Quilters receive many gifts such as fabric and money for batting and other sewing supplies. All that is given is used and we say thank you to everyone for the generosity shown. Not only is LWR important, but so are many here on our own home front. To a person receiving a quilt, the message is clear: you are not alone, you are not forgotten, and someone cares for you. For those in the Loving Hands Quilting group, making quilts represents community, sharing and love. 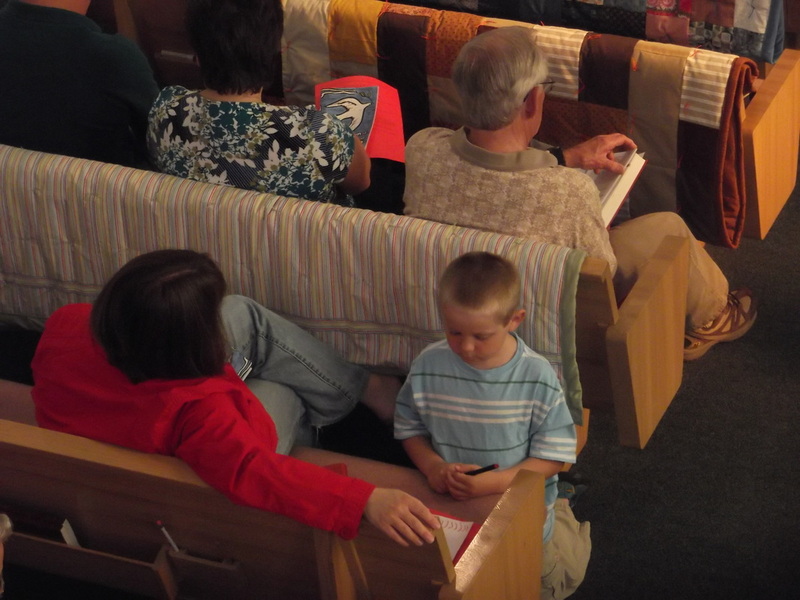 Those who come together each week share prayers, joys and sorrows around our quilting table. Our care is woven into every stitch taken. Thank you everyone for your help in keeping this program alive and for making it possible for Messiah to continue to be so generous with our gifts. We can always use fabric (preferably cotton), old sheets in good condition and thread. Cash is always welcome to help purchase batting. New members are always welcome. We keep our long time leader Lois Strom in our prayers as she is now at the Ashland Health and Rehabilitation Facility. Respectfully submitted by Cheryl Follis and fellow quilters. 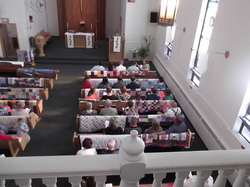 The Loving Hands Quilters of Messiah have been making quilts for Lutheran World Relief for around forty years. Gladys Hovland formed the group and Verna Bloomquist gave us the name. The years have passed along with many wonderful people coming and going. Over these forty years we have produced many quilts—averaging 50 to 100 per year for LWR! LWR quilts are sturdy and quite easy to construct. Anyone can learn the steps! Loving Hands Quilters always welcome everyone. Some people come to see what we’re all about, others just drop in for a visit. We have no membership requirements or religious boundaries. ALL are welcome! We have people who make fancier quilts than the LWR pattern These quilts are given to new babies, high school graduates, fire or accident victims, people who are sick, and people who just need to be wrapped in a soft, warm quilt. If you enjoy quilting and you need a little more space than you have at home, or if you just want to share your pro-ject, please feel welcome to come. We always accept donations—in fact, we rely on donations. Things we need: used fabric—good sheets, curtains, light drapes and pieces cut from clothing all work well, thread, crochet cotton for tying, and cash donations for batting. People in our congregation and community have been very generous with a variety of donations—even sewing ma-chines! We are thankful for their generosity. Loving Hands Quilters will become active again in September. We will reconvene on Wednesday, September 11th. We start at 9:00 am. At about 10:30 we have coffee fellowship, where we talk, share concerns, and pray with Pastor Nancy. Most quilters finish up around noon but others stay later—as late as 4:00 pm! We hope to see some new faces as well as our old ones! Office Hours: Monday and Wednesday 8:30am to 1:30pm; Friday 8:00am to 1:00pm.